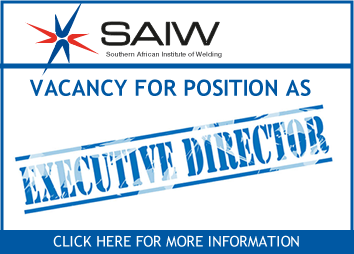 SAIW Certification, the certification division of SAIW, is authorised by the International Institute of Welding (IIW) to operate its Manufacturer Certification Scheme in South Africa. SAIW Certification was the first organisation outside Europe to receive such authorisation. Locally the scheme, which is suitable for both manufacturing workshop and construction site activities, is known as the SAIW Welding Fabricator Certification Scheme. It is based on the ISO 3834 standard – Quality requirements for fusion welding of metallic materials – and certified compliance means global recognition of a company’s capabilities. 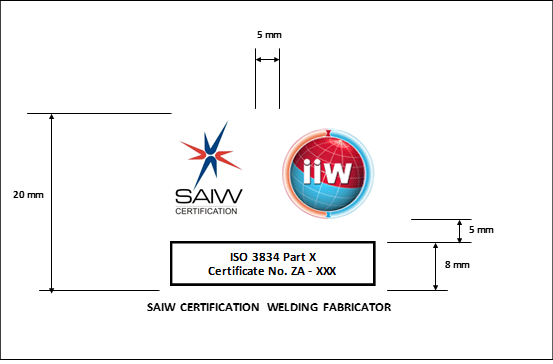 To further assist the South African fabrication industry, SAIW has introduced a second welding fabricator certification scheme based on the quality control system requirements of ASME Section VIII Division 1 Appendix 10. This certification scheme is operated by SAIW Certification in a similar manner to the IIW scheme. Locally the scheme, which is suitable for both manufacturing workshop and construction site activities, is known as the SAIW Welding Fabricator Certification Scheme. 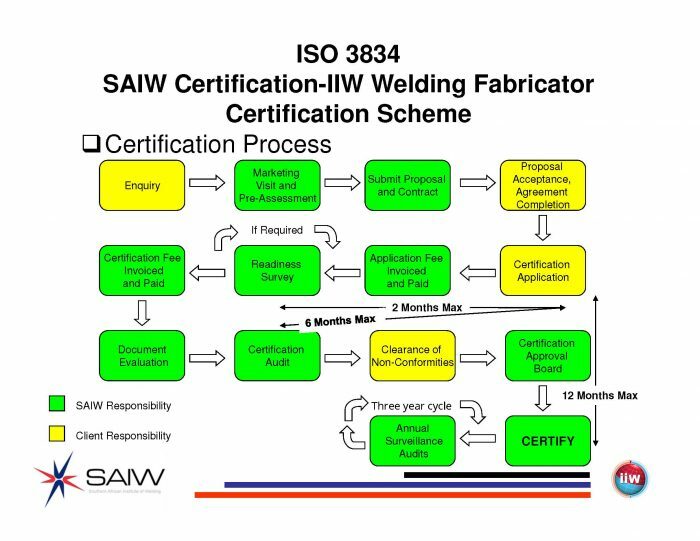 The SAIW Welding Fabricator Certification Scheme is based on the ISO 3834 standard – Quality requirements for fusion welding of metallic materials. ISO 3834 is regarded as the welding quality requirement benchmark of the 21st century and certified compliance means global recognition of a company’s capabilities. The ISO 3834 standard is a tool for the control of the entire welding process from design to final handover. The purpose of the scheme is to help local fabricators become more competitive in both the local and global marketplaces. Having ISO 3834 certification, immediately confirms a fabricator’s competency level to end-users, project managers, design houses etc, and also demonstrates that the fabricator’s quality capabilities are competitive with similarly accredited companies from abroad. Verification of your company’s compliance with the ISO 3834 standard by this country’s highest welding authority, backed by the world’s leading welding authority. Confirmation of your company’s welding and fabricating capability and your staff’s competence. Expert, independent assessment of suppliers. In-depth, authoritative evaluation of fabricator capability and overall competence. Assurance of built-in quality with reduced inspection costs. HOW DO I GET MY COMPANY CERTIFIED? Comprehensive – for specialist welding fabricators where the welding technology, materials and contractual requirements are technically demanding and vary from contract to contract. Typically this could include large steel fabrication projects involving pressure vessels, boilers, rotating equipment, etc. Standard – for fabricators where the welding technology and materials are technically demanding but the variety and range of product are limited. Typically this could include specialist manufacturers of stadiums, shopping centres, steel supporting structures, etc. Elementary – for fabricators where both technology and materials are relatively simple. Typically this could include steel safes, gates,household furniture, vehicle exhausts, tow bars, etc. 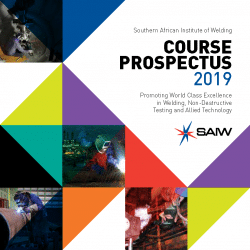 To further assist the South African fabrication industry, SAIW has introduced another welding fabricator certification scheme based on the quality control system requirements of ASME Section VIII Division 1 Appendix 10. This certification scheme is operated by SAIW Certification in a similar manner to the IIW scheme. It is a requirement of SANS 347:2000-‘Categorisation and conformity assessment criteria for all pressure equipment’ that a manufacturer of pressure equipment in category D shall operate a certified quality system for production, final inspection and testing and be subjected to the statutory regulations for pressure equipment. For an item of pressure equipment to bear the RSA/CIF mark, it shall comply with ISO 3834, supplemented by compliance with ASME VIII Division 1 Appendix 10. The scheme introduced by SAIW allows South African fabricators to measure themselves against two of the leading quality management systems in the world which relate specifically to fabricated and welded products. Unlike the ISO 3834 scheme, the ASME scheme has only one quality level, which is equivalent to the ISO 3834 Part 2 Comprehensive level and applies only to the manufacture of pressure equipment. The requirements of both schemes are very similar. Impartiality is understood to be the actual and perceived presence of objectivity. SAIW Certification management, staff and any entity under the organisational control of SAIW Certification is committed to maintaining impartiality, by ensuring that no conflict of interest exists during any of the auditing or certification processes. Functional outcomes are subject to constant risk based assessment and implementation of appropriate preventive actions to mandate impartiality, whether it is a result of conflict of interest, financial or other pressure appropriate, when functional decisions are made by authorised / approved individuals or entities. SAIW Certification will identify risks to its impartiality on an ongoing basis. 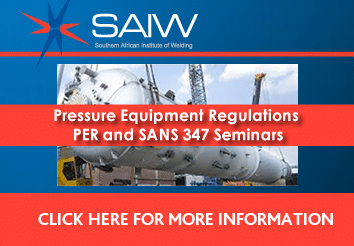 SAIW Certification will not offer or provide management system assessment services as well as management assessment consultancy to the same fabricator. SAIW Certification will not offer or provide any other services in association with the assessment activities to a fabricator that will pose an unacceptable risk to impartiality. The certification body and any part of the same legal entity and any entity under the organizational control of the certification body shall not offer or provide management system consultancy. Where statements are made by any consultants or persons working with SAIW Certification, that certification will be easier, simpler or faster if companies get Certified by SAIW Certification, SAIW Certification undertakes to address and correct this statement in an appropriate manner. The SAIW Certification Governing Board is committed to impartiality in management certification activities and will endeavour to maintain this impartiality by identifying, documenting and managing conflicts of interest between the certification body and its clients and any conflicts of interest arising from relationships. The certified fabricator has the right to publicise its certification by using the Scheme logo in the manner considered most appropriate, provided that such advertising gives a true and accurate image of the fabricator’s capability covered by the certification. In particular, the fabricator is forbidden to alter the certificate or its copies and/to publicise/use the certification outside the specified scope. The logos shall only be reproduced in their original colours or in black and white, and never in any other colour. The size of both logos shall be the same. The maximum width or height of both logos shall be 20 mm. The combined logo shall not be used for other certification not defined in the scope of certification issued by SAIW Certification ANBCC. The combined logo shall only be used while the certificate is valid. Withdrawal of the certificate can be caused by deliberate, imprudent or inaccurate use of the combined logo. Continued use of the combined logo by the Welding Fabricator after the withdrawal of the certificate may result in legal action taken by SAIW Certification ANBCC against the Welding Fabricator. If for any reason the IIW authorisation of SAIW Certification is withdrawn, the Welding Fabricator shall immediately cease to use the combined logo and, where necessary, remove all material containing the combined logo. The continued use and diffusion of the combined logo under these circumstances may result in legal action being taken by IIW against the Welding Fabricator. This document details the procedure to be followed when suspending, withdrawing or reducing the scope of certification issued to personnel and companies. Certification may be suspended on the authority of the CEO SAIW Certification pending an investigation into alleged misuse, incompetence, failure to resolve issues leading to suspension or lack of integrity. In the event that it is necessary to suspend a certificate of competence, the CEO SAIW Certification will notify the Certification Records Office, and send letters of notification of suspension by recorded delivery to the certificate holder and his or her employer.. In this letter it will be specified that the certified person(s) has to refrain of using the certification for promotional purposes and/or use as reference to a certified status. Cases of certificate suspension will be reported by the CEO SAIW Certification to the Scheme Committee at the next ordinary meeting. The certification body shall suspend certification of companies in cases where the client failed to meet certification requirements, see Appendix 12 Section 12. While under suspension the management system certification is temporary invalid pending the outcome of a possible appeal. A suspended certificate may be restored to a valid condition by the CEO SAIW Certification on the authority of the Scheme Committee, after a review of evidence indicates that the reason for suspension no longer applies. Certification may be withdrawn only on the authority of the Scheme Committee after a review of evidence or if the published conditions of validity are not satisfied. SAIW Certification will not withdraw certification until a lack of competence, malpractice, falsification of certification, or failure to satisfy conditions of validity is proven beyond doubt by a formal enquiry, the results of which are to be made available to the Scheme Committee, the company, the certificate holder, the certificate holder’s employer and the complainant (if not included in the above). Certification will also be withdrawn or reduced in scope, in the event of failure to resolve issues that have resulted in the suspension, in the time specified by the SAIW Certification Scheme Committee. Withdrawn certification may be reinstated only after demonstration of competence in a standard recertification examination for the certificate concerned. The Scheme Committee may optionally stipulate that this recertification examination or assessment not be attempted for a period of one year from the date of withdrawal of certification. If successful in the recertification examination or assessment, the candidate or company will be issued a certificate for a cycle. If unsuccessful in the recertification examination or assessment and any allowable retest, the candidate or company will be considered an initial candidate/company for certification and new certificates will be issued only upon success in the full initial examinations/assessments. instruct examination centres of any specific action to be taken in the event that the certificate holder applies for examination. notify the certificate holder or certified company concerned in writing, and provide details of the appeals procedure. Records of NDT personnel certificate suspension or withdrawal will be retained for not less than ten years. 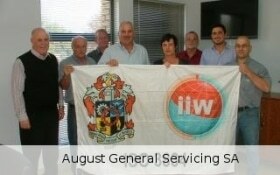 Records for SAIW certified personnel certificate suspension or withdrawal will be retained for 1 year. Records for company certified suspension or withdrawal will be retained for 3 years.